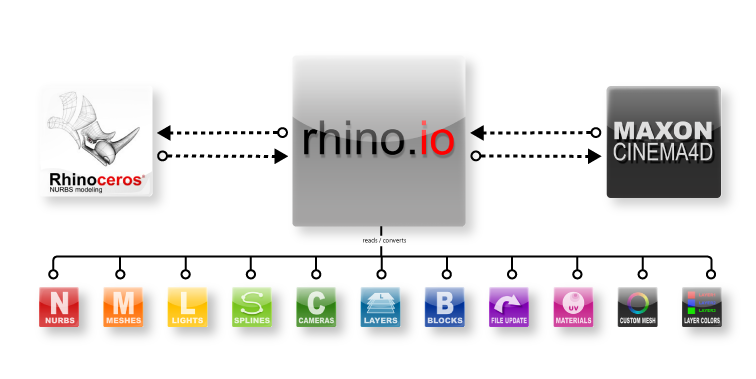 Rhino.io is a connection and import/export plugin, that lets you directly open and save native Rhino files (3dm) from within MAXON CINEMA 4D. In addition, models that were changed in Rhino can be updated into CINEMA 4D while keeping material assignments and other changes inside CINEMA 4D intact, enabling you to work with Rhino and CINEMA 4D side by side. Rhino could therefore act as a “NURBS plugin for CINEMA 4D”, connecting the best of both worlds. Rhinos precise and extensive CAD and NURBS tool set can be combined with CINEMA 4Ds modern and flexible texturing, shading and lighting tools. Models imported with rhino.io are also ready to use for any high quality 3rd party rendering engine such as VRAYforC4D, Maxwell, Fryrender and more. 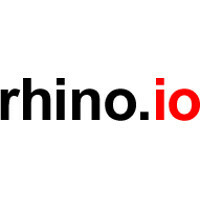 Rhino.io is available now for 99 Euros in our 3dtools.eu webshop. If you work on a rhino v5 beta (win or mac), you can get a rhino.io v5 beta for it to open v5 files, simple ask us to get the v5 compatible version. it is free for all customers. Its good, its fast, its stable! V-Ray today is one of highest quality render tools available for production. It is widely used by professional CG artists and visualizations firms worldwide. Its proven, beautiful and super realistic image quality, at unsurpassed render speed, attracts many users from all areas. VRAYforC4D is the Cinema4D native incarnation of this great engine. It enables you to use V-Ray directly within Cinema4D using the typical C4D like workflow. V-Ray is the de-facto standard in architecture & design visualization, car rendering, TV commercials, and many more areas, like in recent Hollywood Movies like 3D Blockbuster AVATAR. What makes VRAYforC4D special is its extraordinary image, light & material quality, at unbeaten render speed. If you like c4d v13 you will love V-Ray. Nothing else in industry can give you similar renderings at that speed, maintaining at the same time artists freedom, and adjust-ability. V-Ray combines real physical correctness due true BRDF calculations, with high render speed & flexibility. It's capable of delivering the same ultimate image quality also to flicker free object & camera animation, making it the first choice for many studios. You will be amazed by V-Ray's render speed. Nothing comes close to V-Ray in terms of speed in high quality real world rendering. Glossy reflections, high polygon counts, GI, high number of area lights, animations, indoor & outdoor rendering, all will render several times faster in V-RAY (also compared to the v13 internal engine), in highest material, light and image quality. V-Ray is known to be the fastest high quality full feature render engine available. For stills and Animation. In VRAYforC4D you get both at same time - power AND speed ! The best render engine is worthless if the materials doesn't behave fully correct according to natural laws of light. For physical calculation one needs a true physical Material (=BRDF). In Vray the BRDF Material is the heart of V-Ray, not an added effect, very fine balanced to work perfect together with GI, and all aspects of light reflection, absorption and scattering. It is multi-layered, based on true BSDF/BRDF code and brings highly realistic glossy reflections, anisotropy which can both be textured, and last not least perfect and physical based subsurface scattering (fast SSS2, refractive SSS), all at V-Ray light speed! VRAYforC4D is designed by long term Cinema4D artists & developers. We use and love Cinema4d since more than 12 years. V-Ray renders direct in the editor & picture viewer. It renders all native Cinema4D objects, instances, lights, cameras, etc...The VRAY BRDF Material you can use 98% of the native Cinema4D shaders and textures as you are used to it. It uses V-Ray tags to expand the functionality of the native C4D objects. VRAYforC4D ensures a very native "C4D like" feeling and nice integrated workflow. Some users tell us that after some time they see V-Ray the native engine feeling wise, as it integrated full into their daily c4d work. 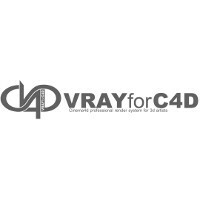 The VRAYforC4D 1.2.6 update just released brings many enhancements. Beside the super easy proxy2 which are even faster and more efficient than before, users can use GI now without loosing one brain cell to any GI setting. The new Universal presets can be used for any scene, indoor and outdoor. Just choose, use and have fun. This presets bring higher quality than before with even more speed. With NOTHING to be needed to adjusted(!). In the same manner there are ready to use animation presets that can be used for very easy non flickering object GI animation. This makes V-ray not only the fastest high quality engine, but also easy to use than never before. V-Ray is available today on all major platforms, Maya, Max and C4D, it became an industry standard over the last years, used in productions like Avatar. V-Ray on regular basis pushing the boundaries of technology to next steps, making things possible in production workflow that had been unthinkable just short time ago. Most major engines on the market look at V-Ray and try develop in similar directions. It stays ahead as technology leader, this ensures your investment in V-Ray also for long terms. Artists who have already experience one V-Ray version will be able to use it on any V-Ray immediately. All version deliver the identical V-Ray render quality and speed. when buying a VRAYforC4D license you get the most recent version of VRAYforC4D, ready to use with Cinema4D (v11, v11.5, v12, v13, v14). it allows you to render on any number of computers with any number of CPUs(!) with V-Ray on net-render at NO ADDITIONAL COST! that's a huge money saver and makes V-Ray one of the MOST COMPETITIVE 3rd party renderers for production. Also free included are all 1.x updates including 1.5. Version 2.0 will cost a moderate fair update price. after that we will have yearly updates at a very affordable rate. We know users want as friendly as possible upgrades and no bad surprises.